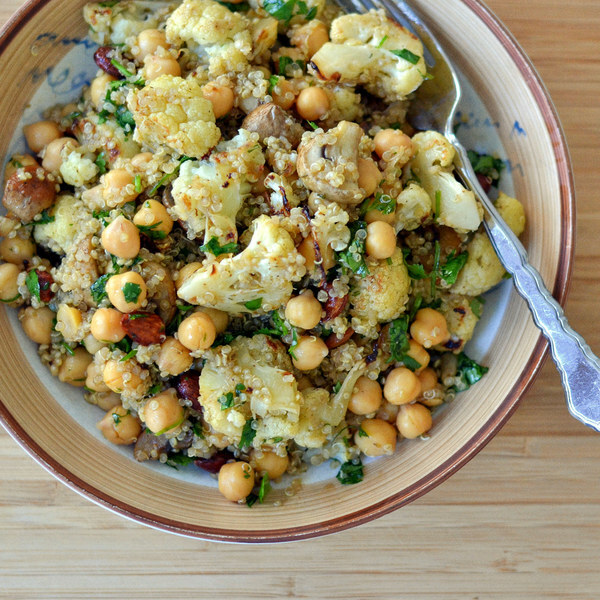 ← Cauliflower, Quinoa & Chickpea Salad with Mushrooms. Wash and dry cauliflower and mushrooms. Cut the cauliflower into bite-sized florets and transfer to a sheet pan. Quarter the mushrooms and add to pan. Drizzle cauliflower and mushrooms with oil and season with thyme, salt, and pepper. Toss to coat. Place in the oven and roast, stirring halfway through, until tender, about 20 minutes. In a large bowl, prepare dressing by whisking together oil, vinegar, Dijon, salt, and pepper. Drain and rinse chickpeas; place on paper towels and pat dry. Add to bowl with dressing and toss to coat. Wash and dry parsley. Shave leaves off the stems; discard the stems and mince the leaves. Add to bowl. Uncover quinoa and fluff with a fork. Add quinoa, cauliflower, and mushrooms to bowl and toss.